Miss Samoa is a crunchy cookie layered in caramel and chocolate, dusted with toasted coconut. I consistently order this product because it is always good & I don't think I'll ever get tired of it. I've even recommended it to my friends that vape. I've been happy with the amount of time it takes for me to get it & the condition of the products has always been well packed to ensure that it reaches me in the right off the shelf condition I would get if I were in the store buying it. One of my absolute favorite flavors and customer service is always excellent! Get new bottles or at least quality droppers to go with the World Class Juice. The juice is awesome if you can get it out. I would only get the miss samoa if you like really sweet flavors. I like everything about it but it does gunk your coil a lot. The things we do for good flavors! Miss Samoa is hands down one of the best juices on the market . I have not seen anyone even come close to this flavor when it comes to chocolate or cookies . It tastes spot on and just never ever seems to get old . I have been getting this one for years . Seriously the only flavor that I vape. I always recommend this one to my friends but seriously if you have not tried this one you have to try this one. i have tried a lot of flavors from both apollo and other companies but this one is my go to. I will never get sick of this one. This is my favorite juice. I panicked when I returned to vaping after some time and couldn't find it! Customer service was awesome. They were nice, quick to respond, and super helpful. They informed me that the brand name had been changed but that this WAS the product I was looking for (thank god!) Shipping was fast too. The product itself is just the best. Tastes incredible, it lasts for ages, and it doesn't have me burning thru coils every other day like some I've tried. Highly recommend! MISS SAMOA EJUICE IS MY MOST FAVORITE JUICE EVER! I have been vaping with this juice for about 4 years and I almost exclusively vape with this juice, but I do try other juice flavors when I run out of my fav or if I come across an offer to try other brands and flavors. I love Getting all of my eliquids and vape stuff from ApolloEcigs because they are fast, have great prices, awesome customer service, and give consistent discounts & frequent sales. Absolutely, hands down, my favorite flavor to vape of all time. The quality of the max VG is great and the flavor is of deep caramel and cookie. I force everyone to try it and actually got my sister to start vaping and stop smoking off of the FA-Q juice. Great company, will buy their ejuices again and again. I have bought Miss Samoa e-liquid so many times now. It is as good as everyone says. Seriously incredible. Now I cannot vape anything else because the Samoa has so much flavor and nothing compares to it. I get two one twenty bottles all of the time. And I always stock up during sales. This is my number one favorite e-juice. I have no complaints about the juice at all. It is perfect. The bottle it comes in could use an update. The dropper in the bottle is complete crap and every bottle of Miss Samoa comes with a crap dropper. If you can get it out of the bottle it's wonderful. Why not just switch to the plastic bottles like everyone else, or get a new dropper supplier. I have loved Miss Samoa for years now. It's my All-Time Favorite and I vape it every day, all day. The chocolate flavors, background coconut are perfect. Thanks Apollo for great products, prices, and service! The Miss Samoa really is as good as everyone says. I have got it a few times. I always buy 2 or 3 bottles depending on the special running. But is a great dessert flavor that is very sweet. Does gunk coils a bit but not an issue for me since i really do like this juice. I have been exclusively vaping with Fa-Q’s Miss Samoa’s ejuice for about 4 years now. I am completely obsessed with this flavor and the FA-Q brand. Their juices are always the best quality premium ejuice that I have used for 6 years since I quit smoking. The juice is filled with flavor and it is perfectly sweet. I recommend this flavor and brand of ejuice to anyone who asks for recommendations. 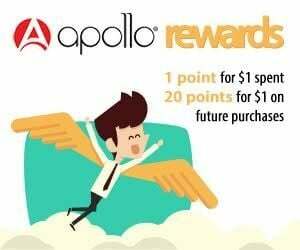 Additionally, I happily recommend Apollo eCigs to all of my friends and family members who vape and/or are considering vaping. Miss Samoa has been my all day vape for a few years now. It really drives me crazy how good it tastes! It never seems to get old. It really does remind me of a chocolate and caramel cookie!! Apollo did a great job with this recipe! YUMMY LIQUIDS, MISS SAMOA being my very favorite . I wish you still had 12mg available, but other than that I am always pleased. This is my long time long time favorite , I always have a sealed bottle for back-up. Sweat flavors and delicious aroma . You can taste the different notes of flavor going in and out . I can't get enough of this one . It's my favorite all time liquid! If you like dessert flavor vaping I strongly recommend it! If you are a fan of dessert flavored juice, without the proverbial Strawberry flavor, then Miss Samoa is your Vape Perfection! Just want to agree with everyone on here. An excellent juice. Definitely give it a go. Best ejuice what there is !!! I have tried juices from a different online company before and it was a huge waste of money so I was scared to order online again. However this juice renewed my confidence in buying juice online. This now my all time favorite juice!! If you are looking for a new all day vape, you should give this one a try! I am always hesitate on ordering new favors but I'm so glad I tried this one! It is sweet but not overbearing, the cookie flavor is what I love the most. The after taste is sweet but not to sweet. It has been my all day vape over RY4. If you like sweet flavored this one is a must!! So I was disappointed when Amy explained that there were new flavours coming as I couldn't get the originals. I've tried them, this is MUCH more "chocolatey". That's great if you want chocolate but actually I prefer the caramel undertones which are much more obvious in the originals. I don't get a single hint of coconut which are there in the originals. Thankfully they have brought the originals back, so I'm going to stock up on those just in case! Its my favorite since long time now. Absolutely the best juice! Flavor is very tasty and full. You catch a hint of all the different flavors of a Samoa cookie! When I started vaping, I struggled to find a flavor I really liked. With Miss Samoa I can taste crunchy cookie drizzled with chocolate, and on exhale a surprise hint of toasted coconut. It never gets or feels heavy tasting to me as some other high VG brands have. (I wrote this review using Miss Samoa 12 mg with a KBox Mini TC-75 and a KBox 70 with a Kanger Top Tank and the older square SSOCC 0.5 ohm coils, leaving off temp control and used in wattage mode) After all the flavors I've tried and gotten tired of, Miss Samoa never gets old to me. It is excellent! Miss Samoa is spot on! It tastes exactly like the girl scout cookie. It is so delicious! It's one of my ADV's! It's sweet but not overly sweet. I love that it's max VG. It produces wonderful clouds and works perfect in my dripper or my Herakles Plus tank. I will forever love this juice and always order it from Apollo. this is the best flavor in the FA-Q family, surprised to be the first to review it, it's just has a weird name. i purchased many flavors Miss samoa ranks up there in top 3 beside unicorn milk by CUTWOOD and dark chocolate by virgin vape, and you should try this one, nobody else has a true chocolate vape, what's cool about this company virgin vape, they send you samples with every purchase. does the FAQ juices come in the squeeze tubes or in the container that it is shown in the picture with the dropper? The FAQ comes in glass bottles with a dripper inside the cap.